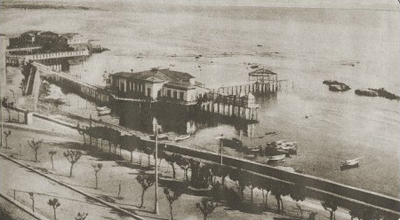 In June 2004 Marcello proposes to the Major of Civitavecchia, a town located 75 Km north of Rome with one of the largest ports of the Mediterranean sea, a feasibility study investigating the possible reuse of a small island used for bathing facilities destroyed during the 1970's by a hurricane. The island, after years of abandonment (the damaged R.C. structural frame was removed many years after the hurricane) is currently configured as a terrace for sunbathers, function that, in our opinion, does not explore the site potential in relation with either the context or use demand. The function proposed for the site is concert hall with accessory catering facilities. The project has the objective of soliciting public attention on an exceptional location currently left unused. It is also an occasion to recall the memory of a site that represented a strong landmark for the inhabitants of the town of Civitavecchia.